The Latest Winners, New Slot Games And Promotions Of Featured Playtech Online Casinos. 1. Angelo S (Italy) won €79,990 playing Rome & Glory on 2nd Feb at Casino Tropez. 2. Guiseppe P (Italy) won €72,882 playing Fantastic Four on 4th Feb at Titan Casino. 3. Maria U (Italy) won €46,350 playing Desert Treasure on 8th Feb at Titan Casino. 4. Lucia C (Italy) won €29,465 playing Keno Xperiment on 9th Feb at Casino Bellini. 5. Anna D (Italy) won €24,719 playing Alien Hunter on 9th Feb at Europa Casino. As Gold Rally has now been won & Beach Life is not yet big enough to play, we would recommend another slot with great jackpots. 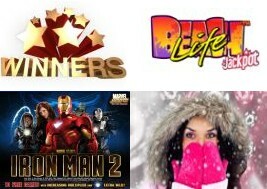 Casino Bellini, Europa, Tropez & Titan Casinos are now all adde the new Marvel slot, Iron Man 2. Vegas Red is promoting the X-Men Marvel slot, as Iron Man 2 is not currently live in this casino. Plus you may try other players' favourites - Rocky and The Incredible Hulk slot machine with bonus feature, highly-rewarding free spins and 4 random Marvel jackpots with minimum value of €/$100,000.00! EuroPartner's next promotion is running 17-20 February. Participating online casinos are offering great unlimited bonuses on all deposits. The next promotion is starting on 24th February and is themed around winter sports... More information to follow next week! Europa Casino's cupid flies down the screen & when you click on him, he shoots and arrow to make a heart explode. The heart releases the special bonus code "CUPID" which will allow the player to receive their bonus. This bonus code is also on the login! Hundreds of new players signed up through this offer and there will be many more to follow! Visit Europa Casino right now and get some extra cash on the house. The current tournament for EuroPartner casinos' winners (VIP6 & VIP13 players) is running 15-23 February. This week's prize total is a huge $4,000 and a second offer of a deposit bonus is also being included in the promotions. This week the promotion is promoting Fun February - a reason to smile during the cold winter months! Take part at the promo - join Titan Casino today.